What is it about an increased wheel count that puts a smile on our face? It must be the ridiculous idea of a road car packing six-wheel drive, not to mention all the engineering required to make it work. Putting engine power out to all that extra rolling mass is no easy job though, but Bruiser Conversions of Clearwater, Florida has seemingly managed the task wheel when it turned a Jeep Wrangler into the lengthy beast you see above. How'd it do it? With an injection of V-8 power under the hood. This heavily modified JK Wrangler originally appeared at the 2017 SEMA show. Now we're getting a better look at the build and we need to find two friends so we can give it six thumbs up. Starting with a Wrangler four-door, Bruiser stretches the rear to accommodate the truck-style bed and an extra rear axle. Both of the rear axles are customized Ford nine-inchers equipped with 4.88 gears and Detroit lockers. An Atlas Twin Stick transfer case distributes the power as needed. And it is indeed plenty of power thanks to the Turn Key Performance LS Engine, mounted in the nose. This rig is designed to show off the LS engine system that Bruiser Conversions has created for Jeep owners. The Wrangler has a [Kenne Bell Supercharged 427 cubic inch LS engine], and this six-wheeler is going to need all of that to get rolling. 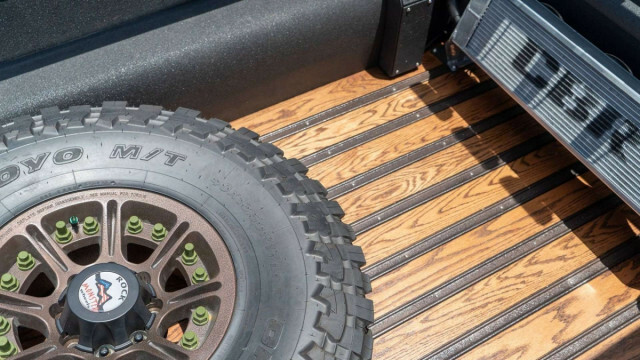 Bruiser has installed six 40-inch tires set on 17-inch beadlock wheels. The rotating mass here is basically its own solar system at this point. Up front, there's a four-link long travel suspension system coupled with Fox coilovers. Out back you have more Fox suspension bits and adjustable track bars. So this is a fully competent rig ready for proper off road adventures. Bruiser has made a name for itself with its clean conversion kits and full vehicle transformations. Typically that is reserved to LS, Hemi, and turbodiesel engine swaps, but the company also offers options to turn Jeeps into pickup trucks. This is the first 6x6 we've seen from Bruiser, and the finished product appears to be very well made.